Hamsters are pretty common household pets. These small rodents usually live for about two years and do best if housed alone. There are different breeds of hamsters. They range in size and characteristics. Know your breed and what it's full grown size will be so you can purchase the right sized cage and equipment. Hamsters are naturally nocturnal, so be prepared for some noises at night and position the cage in an area that works for you and your new pet. Before you buy any pet, make sure you have a home set up for it to minimize the stress of adjusting to a new home. Hamsters have a specific set of needs; they require exercise and mental stimulation, as well as a well-ventilated cage with a place to hide. 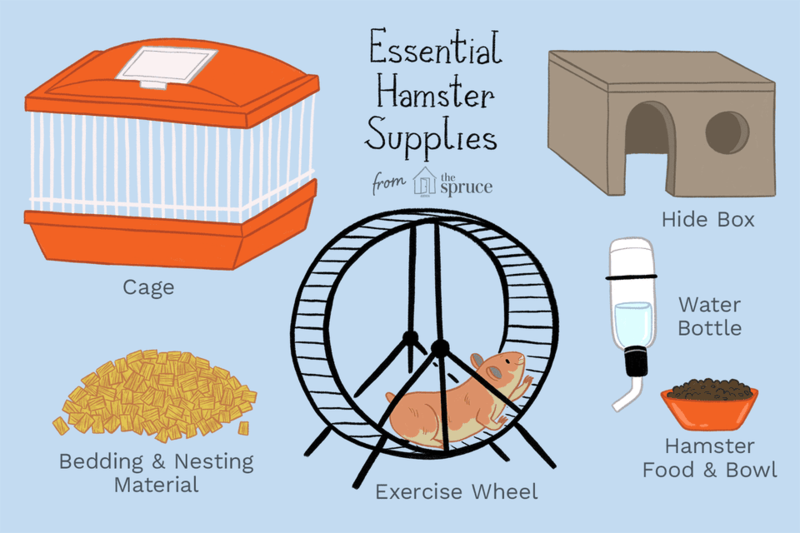 Your hamster will also need a varied diet with a mix of store-bought food and fresh food. Make sure you know what your new pet can (and can't) eat. Get a cage that is large enough, escape-proof, and easy to clean. While the modular cages with tubes are fun, they can be difficult to clean and are poor for ventilation (and the tubes can be too small for some Syrian hamsters). Never underestimate the ability of a hamster to escape, as it can fit through pretty small spaces and chew through plastic walls surprisingly quickly. If you are getting a Syrian hamster, keep in mind that many cages marketed for hamsters will be on the small side. If you are getting a dwarf hamster, be aware that they can often squeeze through the bars of an average-sized hamster cage. You'll want to fully clean the hamster cage once a week. Safely remove the hamster and place it in a secure location while the cage is being cleaned. Avoid cedar and pine-wood chips for bedding for your hamster; the odor can be irritating to hamsters' respiratory systems. Aspen is a safer option if you prefer to use wood bedding, but many people prefer to use paper or other fiber-based beddings. Hamsters love a cozy nest for napping; the cotton nesting materials found at pet stores is unnecessary and can cause problems if eaten or if it gets wrapped around their toes. Shredded toilet paper or facial tissues are excellent nesting materials and are economical as well. Bedding materials can be cleaned out and replaced during the weekly cage cleaning. Choose a good quality food for your hamster. Pelleted foods offer a good nutritional balance and for many hamsters are a better option than loose food mixes. With a loose mix (seeds and other items), your hamster might pick out what it likes and leave what it doesn't, which could result in a dietary imbalance or an overweight hamster. A pelleted mix can be supplemented with a variety of other items, including fresh vegetables. Hamsters should be fed once a day. Remove any fresh food that has not been eaten within a few hours. A small hanging water bottle with a stainless steel spout and ball is the most commonly used water container for hamsters. A bowl is too likely to be spilled, dirtied, or filled with bedding. Make sure your hamster always has fresh water. Hamsters love to run and need the exercise, so purchase the largest, best-quality exercise wheel you can. It should have a solid surface for running and ideally no cross supports (that might catch a leg or neck). Look for one that mounts on the side of the cage. Make sure the wheel is quiet as well since hamsters run at night. A small amount of vegetable oil dripped onto the wheel axis may aid in keeping the wheel quiet. Your hamster will appreciate a private getaway for sleeping. A house or hide box can be as simple as a small cardboard box (it will have to be replaced often but it is economical), a plastic hide box (it may be chewed up), a wooden box (it may be chewed or get soiled and smelly), or other things like a half coconut shell or a small clay plant pot. Upside-down plastic food storage containers such as a butter tub can be used if you cut out a door for your hamster (making sure there are no sharp edges). In addition to a wheel, your hamster should have a variety of things to chew on and climb on. Hamsters need a lot of stimulation and exercise, or they can become bored. Bored hamsters start trying to chew through everything, with escape being the likely outcome. Plenty of hamster-safe items exist in the pet store, or you can use toilet paper tubes and tissue boxes to make toys for your hamster. Hamsters are pretty hardy pets. The issue is that if something goes wrong, the hamster is so small, it will be affected pretty quickly. Keep an eye out of an inactive hamster, not eating, diarrhea, hair loss, sneezing, or runny eyes. Some of these can be due to infections or even pneumonia. Try to keep your hamster warm and hydrated and speak to your vet about what to do. A hamster escape is another common issue. If you hamster escapes, keep watch near the cage and then spread your search out to other rooms. Since they are nocturnal creatures, keep watch at night and check under and behind furniture. If possible, leave the cage open with plenty of food so the hamster can return on its own.